First – DuckDuckWhat? DuckDuckGo is an independent, privately owned search engine. It can be a drop-in replacement for search like Google. And it’s now a default option in browsers like Firefox and Safari, and easy to add to others – even on mobile. I’ve been using it for a couple of years now and rarely turning back to Google, and for anyone who knows me, I’m a very heavy search user. DuckDuckGo has a number of characteristics that set it apart from competitors. Privacy is the big selling point the service likes to advertise, in the form of anonymity and (optional) advertisements that work without using tracking. Privacy concerns aside, there’s reason to appreciate the fact that search results lack personalization. While we normally think of personalization as a good thing, with search, there’s some advantage to seeing generic results, not weighted to your own previous searches. It can create a filter bubble and prevent you from seeing new information. But, okay, that’s not a whole lot of fun. 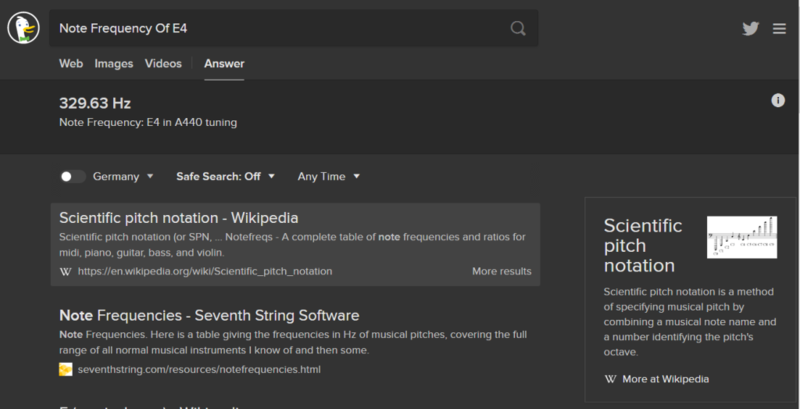 So let’s instead try some tricks with DuckDuckGo that make it really useful for electronic musicians. Some of this is possible with Google, to be sure, but part of what makes DuckDuckGo a unique alternative is its community engagement. There are tools for creating custom integrations, clever original content pages, resources for developers, and even open source-licensed access to some of the code that makes the search engine work. 1. Get formatted Wikipedia offerings – including on gear. 2. Look up vintage synths quickly, with a bang. There’s one for the ever-useful Vintage Synth Explorer. Just type !vse followed by your query. 3. Find music chord diagrams. 4. Convert frequencies and musical pitches. 5. Find resistors for electronics projects. 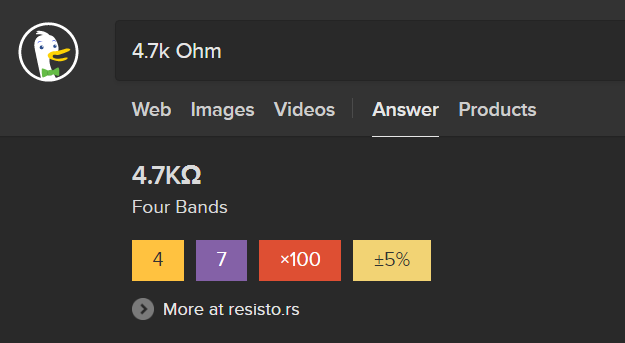 Type in colors, (“Red Yellow White Gold Resistor” or “Resistor Red Yellow White”), and get values. Or type in values, and get colors. And since this works on mobile, too, it’s worth keeping DuckDuckGo at the ready on your phone while working. For more advanced projects, you’ll also find tools like binary logic operations and a binary/ASCII converter. 6. Access a rhyming dictionary and write some lyrics. … and find lots of other surprises. And so that’s another reason to use DuckDuckGo – you get regular, clever surprises, because the people running the service and the wider community developing for it are constantly inventing stuff. You get that from Google, too, but always with some strong commercial flavor. It’s cool when that service anticipates what you want to do, but a lot of times it feels like it’s trying to sell you something in the process. DDG feels like it was built just by other people who love using the Internet. With that in mind, if you come up with your own tool or know some interesting tricks, we’d love to hear about it.